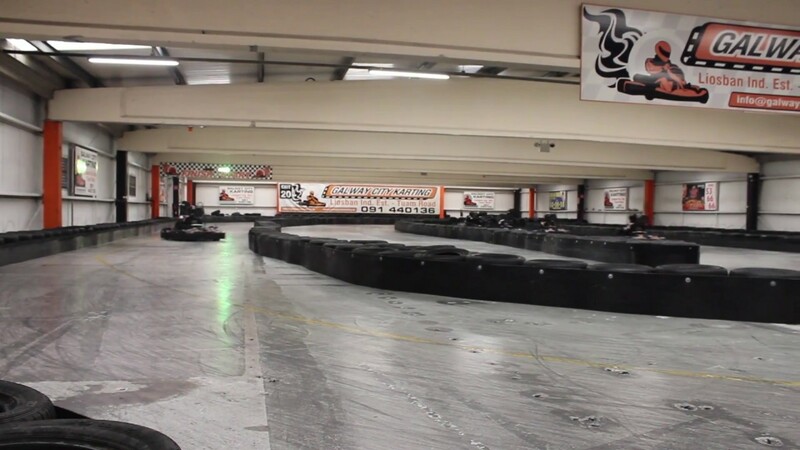 Galway’s only indoor karting track has welcomed thousands through its doors since opening in 2011. The track located in the Liosban Industrial Estate has been providing karting fun to everyone from 7 to 77! The 20,000 sq ft indoor track has been designed and engineered so that you get maximum fun from your karting experience. Galway City Karting has karts for junior from 7 years and up! All of their karts are powered by Honda Engines with the junior karts having a 160cc engine whilst their adult karts have an engine of 200cc. Spectators are welcome for any of our events so if you have friends who want to come down to watch the go karting please bring them along. Public Transit – Bus Eireann operates the 405 service from Eyre Square which has a stop seconds from our door. Galway City Karting is the number one venue for hens, stags, kids parties or team and staff bonding events in Galway. Our track designers have spent years testing & shaping the course so you can maximise the thrill of this challenging indoor track. Want a fun and stress free Stag or Hen, then Galway City Karting is your only answer. Our packages offer great value for money and we can custom a tailor made package to suit your group. Staying in Galway – we can even organise a pick up from your accommodation. A Corporate or Team Building Event can sometimes be perceived as work & perhaps a little dull! Not at GCK – we can set up a roster of events with time challenges, races, grand prix and lots more. So whether its communication, leadership, teamwork or just plain fun, Galway City Karting is the answer!